Infill Products – What is the Best Program? In a previous post, we talked about direct construction costs and the relationship to infill developments. Today, we would like to expand on that a bit more as it relates to not only the costs, but also to density and home pricing regarding infill products. 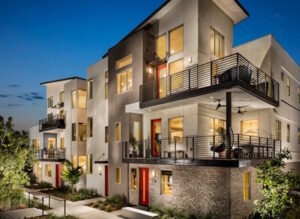 We are seeing a lot of three-story row townhomes being built here in Southern California. Twenty years ago, we had a plethora of master planned communities here in the coastal counties that were supplying lots for mostly two-story products, with maybe some single-story homes being offered. With most of these master plans all built out, these coastal areas have limited land supply and therefore limited new home offerings. Many builders, including the large publics, have become heavily focused on small infill parcels to feed their operations. And it seems that these three-story towns have become a popular solution, with the market absorbing at very healthy prices. Argus College held a land acquisition workshop where we examined all of the variables that go into finding the optimum project from a market and financial viewpoint. The instructors throughout the day included a developer, land planner/architect, market analyst, and two homebuilders. Various infill product types were discussed, ranging from two-story small lot detached (10 per acre) up to three-story townhomes (26 per acre). We looked at market data from infill projects, and our market analyst talked about price differentials based on detached versus attached, two-story versus three-story, and specific product features (driveways, yards). We discussed construction costs, with our homebuilder experts explaining their viewpoints and where the costs lie. In the end, we plugged assumptions into a pro forma and we found that just maximizing the density was maybe not always the best solution. The premiums for two-story or detached living, along with less construction costs, made a case that these 20-per-acre, three-story row townhomes might not always be the optimal solution. Again, much of this is dependent on the specific location and local submarket conditions. Some builders are very adept at thoroughly analyzing the tradeoffs of density, pricing, and costs in these infill parcels. As a land developer, it can be very advantageous to look for creative architects and infill market experts. And if we can get our arms around the direct costs for all of these various infill products, we should be in the best position to find the right program. If you have comments, experience, or questions relative to this topic, we welcome you to share below. John Kaye has over 30 years experience within the land development and homebuilding industries, having held senior management positions with The Irvine Company, Koll Real Estate Group, and Brookfield Homes. As a developer, John has overseen the land acquisition, entitlements, and development of master planned communities, residential tracts, urban infill sites, and land assemblages. His experience and skill sets include land acquisition, land brokerage, project management, market analysis, finance, and strategic planning.